Oat bran was once reserved for use as livestock feed. Thankfully, it was finally recognized as one of the most important foods for good nutrition. 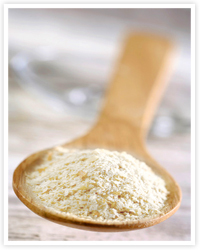 Discover the many health qualities of oat bran and learn why it is important in The Dukan Diet. Try our new Oat Bran Crackers! High in fibre, Ideal for breakfasts, snacks and to serve with cheese. Find them here. 1. Oat Bran is Delicious! 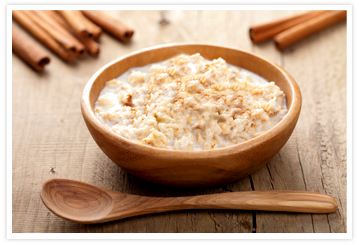 Ideal for breakfast as hot cereal or mixed with yogurt or cottage cheese. Oat bran can also be used to make savory pancakes, pizza crust, muffins, cookies and much more! As the only source of carbohydrates during the Attack phase and Pure Protein days, oat bran brings an extra element of variety to the diet. Oat bran contains soluble fiber, which reduces the low-density lipoprotein (LDL), otherwise known as the "bad" cholesterol. 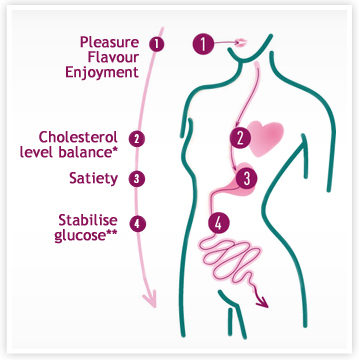 The soluble fiber reduces the absorption of cholesterol into the bloodstream. When compared to oatmeal, on average oat bran has 50% more fiber and soluble fiber, making it much more efficient. Once consumed, oat bran enters the digestive tract where its soluble fiber absorbs water and forms a gel-like substance, creating a feeling of fullness. Oat bran absorbs on average 25 times its volume in liquid. A tablespoon of oat bran, about half an ounce, forms a 13 ounce ball in the stomach. The feeling of fullness and being less hungry leads to much less frustration while dieting. 4. Oat Bran Slows Down Sugar and Fat Absorption. Once ingested, the bolus (the gel-like substance created by the oat bran and water) passes through the gastric acid, bile, and finally the pancreatic juices. This turns the bolus into pulp and reduces it to a mix of elementary chains, fatty acids, amino acids and glucose.This process both slows down the sugar assimilation and removes calories from the body by reducing the absorption of dietary fat, while keeping your blood sugar levels low and stable. Which Oat Bran is Right For The Dukan Diet? You can find oat bran in the cereal aisle at all major US supermarkets and natural foods stores. Just make sure that the ingredients say 100% oat bran (and not steel cut or rolled oats) and that they do not contain other ingredients. How much oat bran should be eaten in each Dukan Diet phase? What is the difference between oat bran and oatmeal? Gluten-free oat bran does exist although it is not as common as the regular oat bran. It can be found in some major supermarket chains, but it is more commonly sold in specialized natural foods stores. You can also find it online from a number of reputable sellers.